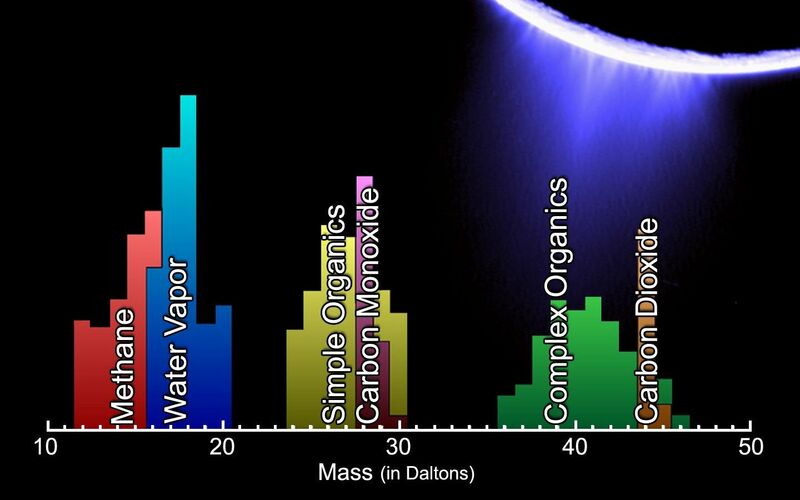 The lower panel is a mass spectrum that shows the chemical constituents sampled in Enceladus' plume by Cassini's Ion and Neutral Mass Spectrometer during its fly-through of the plume on Mar. 12, 2008. 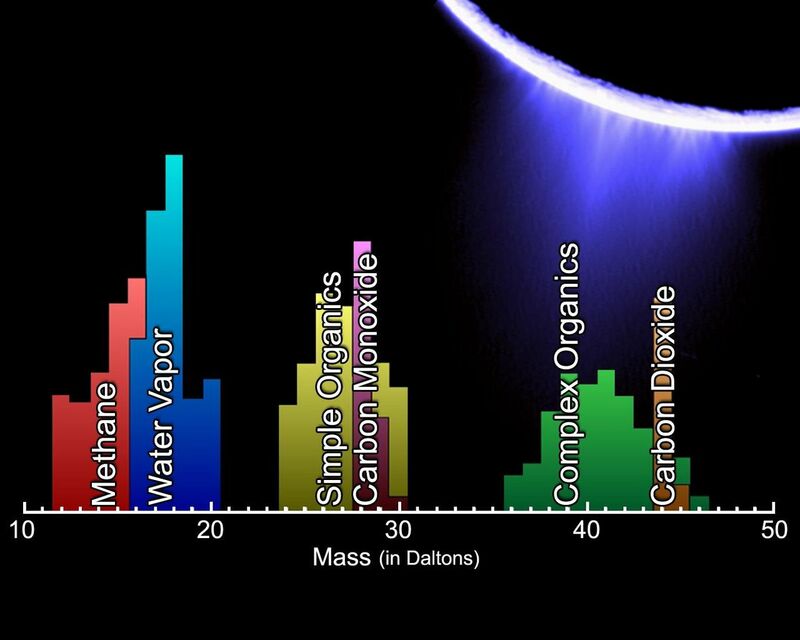 Shown are the amounts, in atomic mass per elementary charge (Daltons [Da]), of water vapor, methane, carbon monoxide, carbon dioxide, simple organics and complex organics identified in the plume. 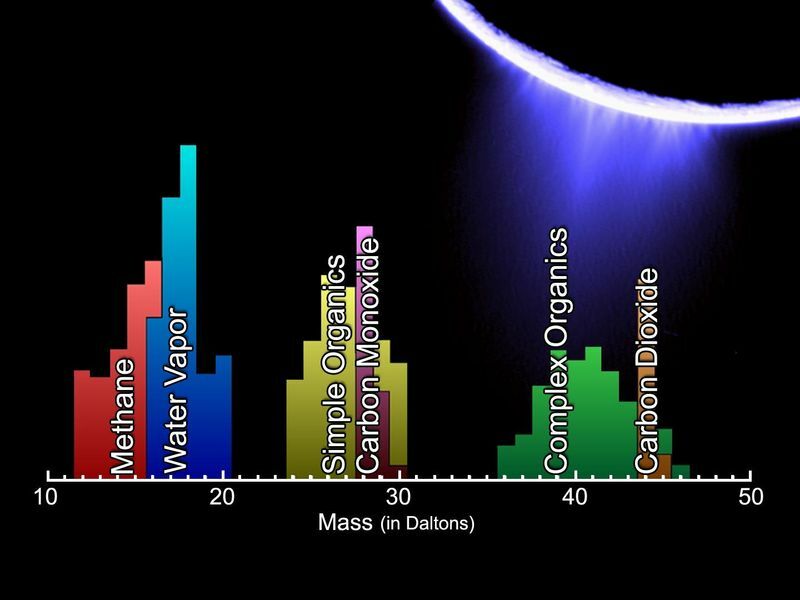 The Cassini-Huygens mission is a cooperative project of NASA, the European Space Agency and the Italian Space Agency. The Jet Propulsion Laboratory, a division of the California Institute of Technology in Pasadena, manages the mission for NASA's Science Mission Directorate, Washington, D.C. The Cassini orbiter was designed, developed and assembled at JPL. The Ion and Neutral Mass Spectrometer was designed and built at NASA's Goddard Space Flight Center, Greenbelt, Maryland, and the team is at Southwest Research Institute (SwRI) in San Antonio, Texas.